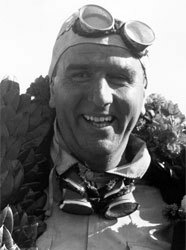 The Italian pre-war ace was arguably past his best when he won the inaugural world championship in 1950 when a month short of his 44th birthday, although a little age gave the driver who was once grand prix racing's wild man the maturity to win a title. Alfa Romeo's lead driver in 1950, he fought hard to beat team-mate Juan Manuel Fangio to the 1950 title after winning three of the six world championship grands prix. But the writing was on the wall, and in 1951 he could do nothing about Fangio's speed. It was a similar story at Ferrari in 1952-1953, when he played second fiddle to Alberto Ascari, although there was a final victory at the age of 47 in the 1953 German Grand Prix before he started to wind down in 1954. If ever there was a case of the Second World War robbing a driver of his best years, it was Farina. Should Giuseppe Farina be higher or lower in F1's greatest drivers?